I thought I would post a little tutorial about Persian skewers this week in light of last week’s post about Jujeh Kabob. You may have noticed that the skewers that I used are not the skinny wooden type that people are usually used to using when making kabobs. There are two different types of skewers used when making Persian style kabob. 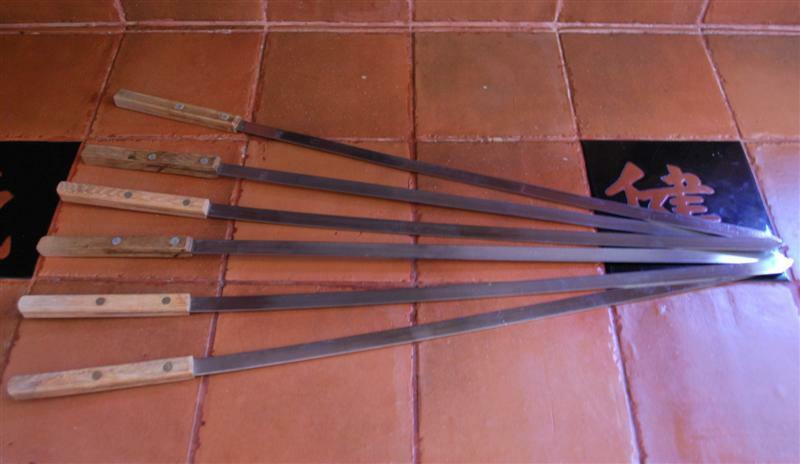 As you can see in the picture above these are metal skewers with a wooden handle. They are long, flat, and narrow. This is the type of skewer that Persians usually use for grilling chicken kabob and tomatoes. These babies have quite the kabob mileage on them. They were passed down to us by one of my favorite people in this whole entire planet Hamid. Since then they have pretty much been used every time we make chicken kabob. The second type of skewers are the same length as the ones used for chicken kabob and are also flat, however, they are wider. These skewers are predominantly used for Kabob Koobideh, which is ground beef kabob. These workout better for this type of kabob because there is more surface for the ground beef to stay attached giving it the flat and wide look. I love using this type of skewers because you can grill larger quantities of meat and also spend less time skewering. They are also easy to clean AND you don’t have to soak them prior to using or worry that they will catch fire! Hello – I just stumbled upon this website. I have fallen instantly in love! I will be visiting often and plan to make an appetizer for my Persian neighbors. Glad you found us! We have a few appetizers up already and will be posting more as I make them. So the possibilities are endless! 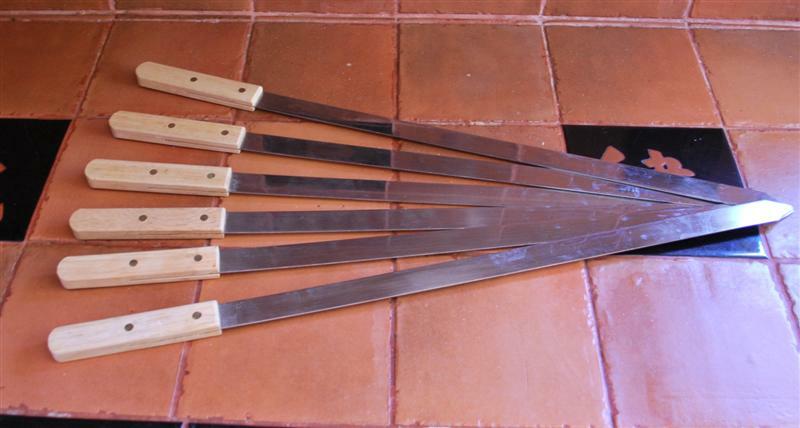 I totally need to find some metal skewers…do you have a good online resource to buy? I did some search and I could only find one website where they sell the skewers that I am talking about in my post. Here are the links for both types. I have to say though that I have never purchased anything from this site as there are Persian stores near me where I can buy anything I need. Skewers for kubideh kabob and skewers for chicken kabob. Where do you buy the sqewers? Also where do you find the form for putting hamburger on the sqewers? Any restraunt supply in Los Angeles? William, all Persian stores carry the skewers and I believe most have the form that you mention. I have tried making the ground meat type twice and both times the same result, all of the meat came off the skewer. I have the long flat ones, and do add egg as a binder. Any Suggestions? Brent, I am working on perfecting the recipe! Brent, I consider myself as a novice and like you, I have experienced the meat coming off the skewer. I have found that the best ground beef to use is 80% lean and 20% fat. Where I buy my meat, that happens to be Ground Round. I cook my kabob on a Weber charcoal grill and I cheat. I have a larger sized grate that fits on top of the grill. This allows me to salvage any of the meat that comes of the skewer. I have seen some recipes call for bread crumbs. Perhaps this binds the meat more (I haven’t used bread crumbs but plan on doing so). Another tip is to drain the onion juice prior to adding to the meat and the colder the meat, the better it binds to the skewer. I like marinating overnight. Lastly, the next time I cook kabob, I am going to brush the meat with Light Oilive Oil. This should help mitigate the meat sticking to the grill, and pulling off the skewer. Hope this helps. Where can I buy the koobideh skewers? I have been working on my koobideh recipe, and have found that basting with a mixture of butter and lime helps prevent sticking to the grill. I was wondering what folks use to get the ridges in the kabob…I have tried just squishing with my fingers but would really like to get the even ridges they have at restaurant…does anyone know how they do that or if there is something I can buy to use to get the nice ridges? What I do at home is put the meat mixture in my kitchen aid (with the dough hook) and have it knead the meat until pink and pasty. Let rest for a while before working a handful onto the skewers with wetted hands. Though I’d like to know how restaurants create such deep ridges (valleys) as well. I do a ‘scissor-hand pinch’ approach but it’s not as aesthetically pleasing as some koobideh skewers I’ve seen (some pinch right down to the metal and have the meat hold during cooking! Amazing). 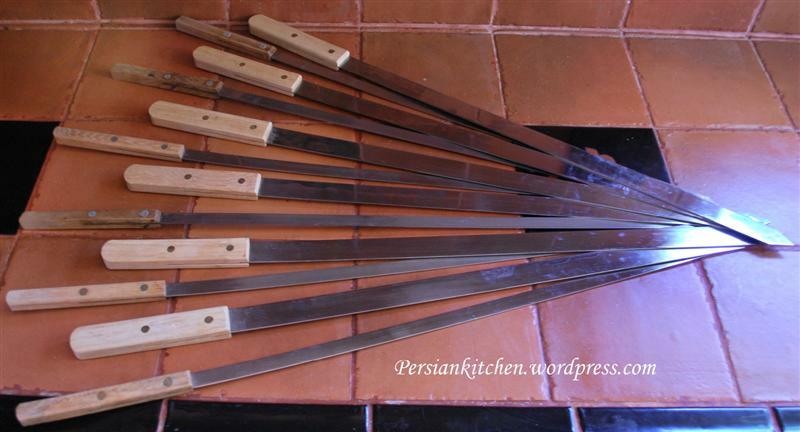 Where and from whom can I buy a set of Iranian skewers for kabab e koobideh? Thanks. David, please check Sadaf.com for skewers. Just checking if you have a good recipe for koobideh kabob and jujeh kabob. Thanks, love your site! hi, i’d like to order some Koubideh Skewers. do you deliver to UK? James, I am not a seller. where can i get some of your persian flat skewers both sizes ? Matthew, you can purchase them at Persian stores or online by clicking here. I was wondering if you have yet perfected the koobideh kabob and posted your recipe. I love your site and visit often to get recipes, but cannot seem to get one for koobideh. I have tried several of your recipes and my family always gives them a thumbs-up! I am not persian so my husband critiques the dishes and likes them very much. But you didn’t give any instructions on USING them? My lamb always falls off these skewers, what is the secret to using them? Do you know if you can buy these in the UK? If you dont, I may have to ask my local kebab shop! James, you can try any Persian stores or online.